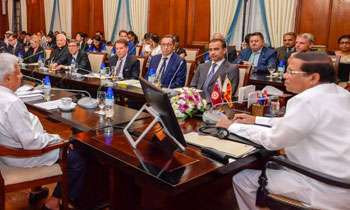 President Maithripala Sirisena briefing foreign diplomats at the Presidential Secretariat yesterday had emphasized that new Prime Minister Mahinda Rajapaksa was appointed according to the powers vested in him in the constitution, the President’s office said. During the meeting the President explained to the diplomats regarding the conflicting grounds that existed within the previous government, which led to the appointment of a new Prime Minister. The meeting was held at the Presidential Secretariat, to apprise foreign Ambassadors and High Commissioners regarding the prevailing political situation of the country. The new government is expected to further strengthen the existing ties with the countries in the world in keeping with the non-aligned policy, the President said. He also requested the cooperation and assistance of all the countries for the development activities of the government. Several diplomats expressing their views said that they wish Sri Lanka would adhere to the constitution of the country and will conduct the activities in a manner that would assure law and order in the country. All the Ambassadors and High Commissioners in Sri Lanka participated in this meeting and Ministers Sarath Amunugama and Mahinda Samarasinghe and former minister Prof.G.L. Peiris also attended this meeting. Diplomats are wise enough to understand the real situation. Ow aney, even without seeing the protesters no!!? The problem now for MS is, once all are over, convincing the international power that an internal investigation machsnisam will be in place before next March with MR sitting next to him. Lankaboy from where are you! All these drama is to get thesupport for the 2nd term. Illiteracy show to world. Why They still not recognized ? They will teach you the constitutions. This is JRJs constitution. He said at the time in 1978 that only thing he can't do with the contitution is turn a man to a woman. Unfortunately both head of state and head of government is president. Hope my3 will abolish JRJs bahubootha viyawasthawa by end of his term, or are we dreaming? China is a close friend but reality what democracy is in place in China?. Several diplomats expressing their views said that they wish Sri Lanka would adhere to the constitution ..MEANS THEY HAD THE DOUBTS AND .HERE PRESIDENT HAD TO EMPHASIZE. SO THE GAME GOES ON WITH THE INTERNATIONAL COMMUNITY. They have already expressed their views, Open the parliament prompt. Power of constitution to do right things, not for wrong decision. Seems you are strong supporter of unp and do not care much for the country. It's not about being a UNP supporter or an SLFP supporter. It's about doing things in a legal democratic manner by following the constitution of the country. Otherwise we become a banana republic. Is that what you want? Whom is he trying to fool?? Hope he didn't say this in English..
Again soon you will me the diplomats once rajapakse kick you out on to the street. This President will be the ONLY person got Cursed by the entire people of the Country. Bcs he got Cursed by Mahinda supporters in 2015 and now get Cursed by Ranil supporters. How much they love the constitution once SLFP pledged to completely abolish branding it a dictatorial one? Your Excellency ,refrain from any foreign trips in the near future .There's a chance you,LL find all your bags out on the street and someone else sitting in your chair . Who else now got the chance other than tsunami hora? The constitution is at work in Kolpitiya. This is a white Sarong coup by two unprofessional elements to overthrow the countries legitimate PM. So called " White Sarong" they were the same people who rescued the country from ltte and we all are enjoying the freedom and the peace. Short memory !!. No where in the constitution say that he can appoint an ex-corrupt president as PM. Is he so bankrupt or is he suffering from Alzheimer to forget what he uttered when he stabbed the 'present darling' in his back? We are the damn fools to have chosen you.